The entrance road for the riverside park is a half mile south of Cave Junction and the first road on the right after crossing the bridge over the East Fork of the Illinois River. Follow the paved entrance road for a half mile to the park’s parking area where the road ends. The swimming area along the West Fork of the Illinois River will be on your left as you enter the parking lot. The disc golf course is on the right. The East and West Forks of the Illinois River meet at the valley’s only riverside park, a grass covered day use area locally known as the “Forks Park.” There are picnic tables and pit toilet but no running, potable water. Things to do here include disc golfing, picnicking, swimming, and hiking. The park is wheelchair accessible, which includes access to a wheelchair friendly nature trail. The day use area is open during daylight hours – dawn to dusk. Dogs must be on leash. No camping available. The area used for swimming has a combination of sandy access points with gentle slopes and rocky areas with sharp drop offs into deep water. The sandy access points provide a combination of shallow water wading for young visitors and deep water for those who want to swim. Currents are generally gentle during summer months but can be forceful and swift during winter and early spring. Be cautious of slippery rocks and sharp drop offs when approaching the river. 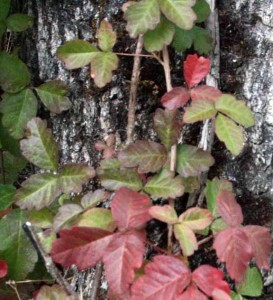 Poison oak leaves are most commonly identified by three, glossy leaves on each leaf stem. The width of this trio is rarely more than 2-3 inches.Leaves sometimes turn a red color. Click image to see enlargement. 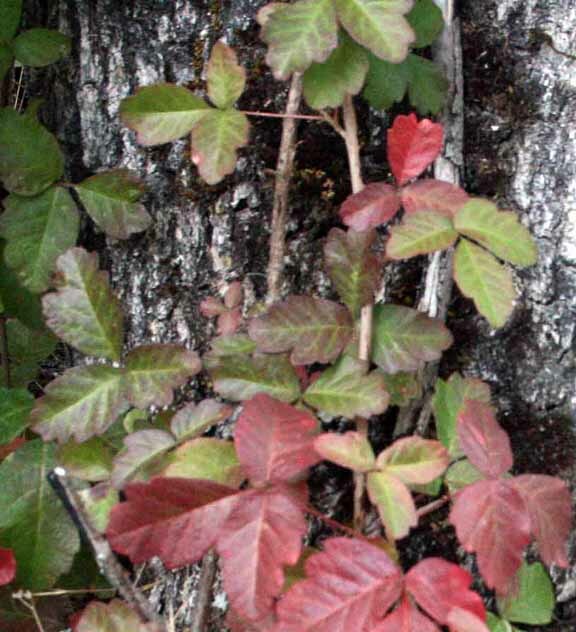 Poison oak is common in all parts of the park but is generally not a problem if you stay on trails. The plant may be seen growing like a vine on trees as you enter the park if you want to stop and see what it looks like. 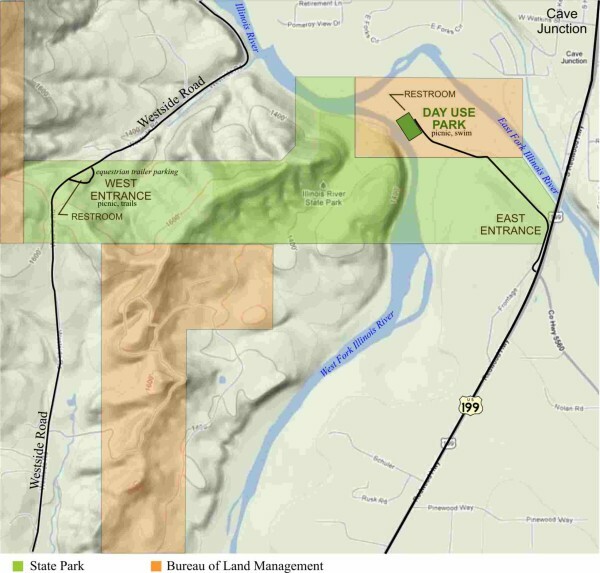 The map below helps explain how the recreation opportunities you enjoy at Illinois River forks State Park are the result of a cooperative agreement between the Bureau of Land Management (BLM) and the Oregon Park and Recreation Department (OPRD). The original park that was established in 1962 was only 80 acres in size that extended from the East Entrance to the West Fork of the Illinois River. In the same year, an agreement was signed to allow OPRD to manage 80 acres of BLM land to provide the same quality of recreational experiences as visitors expect to find at Oregon State Parks. This is the brown colored land in the upper right of the map, which also contains the day use park and main area used for swimming. About ten years later, additional land was donated to OPRD by a local land owner and created the T-shaped park you see in the map below. Illinois River Forks State Park utilizes a combination of state park land and land managed by the Bureau of Land Management (BLM). The day use park sits on BLM land that is managed by state parks through a cooperative agreement signed in 1962. Other BLM properties adjacent to the state park are also used as part of the state park’s westside trail network.